The Drawing/Painting I students were to create a large format drawing based on the grid. They were to use only tones to define shapes and extend their value scale found within their subject matter. Drawings range from 16×20″ to 18’x24″. The Advanced 3-D Design students are creating prototypes for future inventions based on their daily consumption of electronics, fashion, technology, etc. Visit us for more images. The Art Foundations 3 last project of the semester was to select an Impressionist, Expressionist, Abstract or Surreal artist and reproduce the work based on style and size. Most, if not all, paintings were created using oil, the students used acrylic paint. 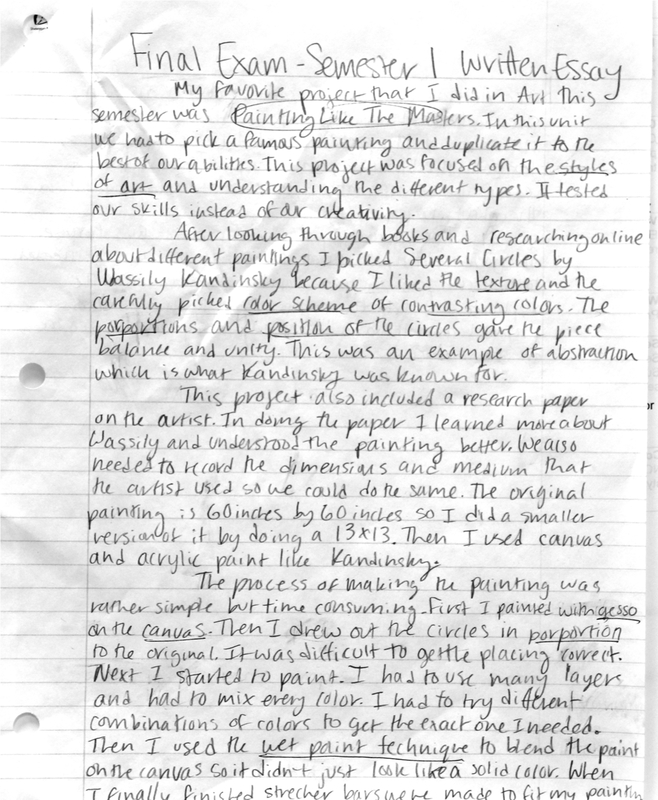 They were to write a one-page paper on the artist to gather research and to learn more about their chosen artist. Art students were expected to mix their own colors, replicate the image on canvas and assist with stretching the canvas. A year ago, the North High Art Department decided to implement a written final to replace the standard comprehensive final. 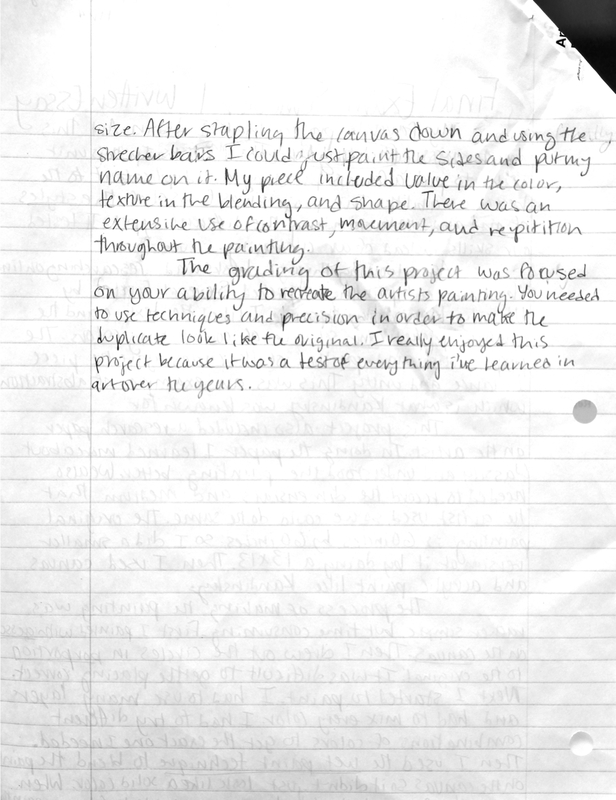 We felt that a written final would provide us with a more accurate assessment of student knowledge, application and understanding of art concepts & techniques. On January 14, 2012, North High School Art Department hosted its 1st Annual Art Teacher Idea Exchange hosted by the Wisconsin Art Education Association and local WAEA members, Carol Rokicki of North/South High School and Brian Sommersberger of Random Lake Elementary School worked together along with Lee Amborn of Black River Falls Middle School to develop an open invitation to K-12 art educators in the North East Region, which included local colleges and private schools. 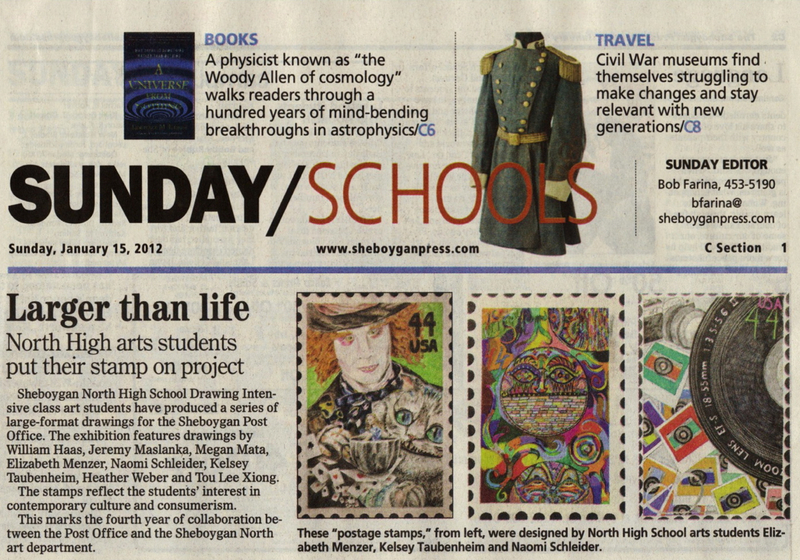 Lee Amborn has been doing the Annual Art Teacher’s Idea Exchange in his district for the last 28 years. Carol and Brian thought it would be a wonderful opportunity for art teachers to get together and exchange ideas/lesson plans and instructional thoughts. Those who participated were told to bring numerous copies of one lesson plan plus visual samples. Teachers were also asked to bring one “teacher tip” to share. Participants were excited about having the opportunity to see different ideas and approaches to art instruction. About 10 art educators attended the 1st Annual Art Teacher’s Idea Exchange from various grade levels and districts. 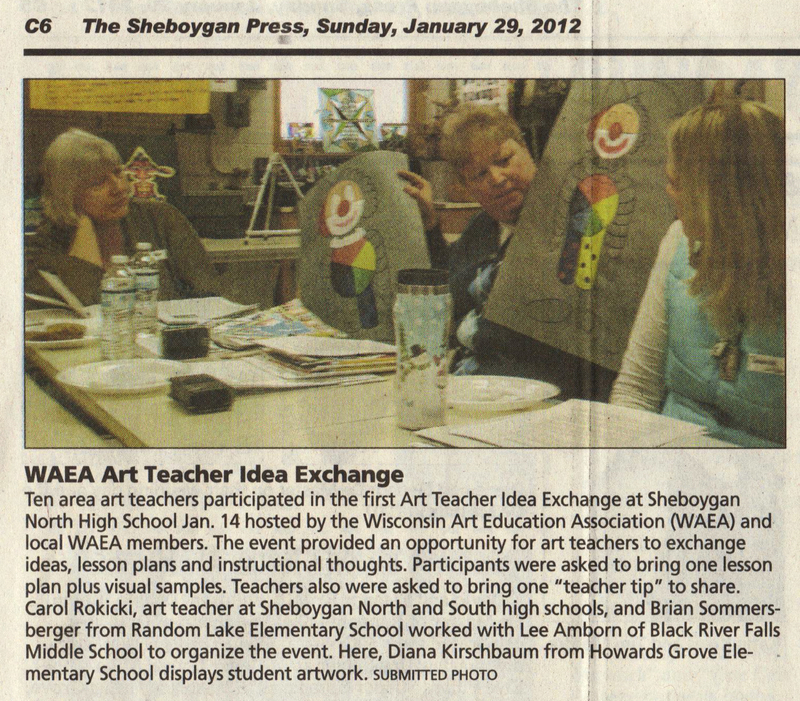 The 2nd Annual Art Teacher Annual Idea Exchange is already being planned for next year. Brian Sommersberger is currently serving as WAEA’s North East Regional Vice-President. Carol Rokicki is currently serving as WAEA’s Secondary Representative. Click here to view video and see photos of this event. 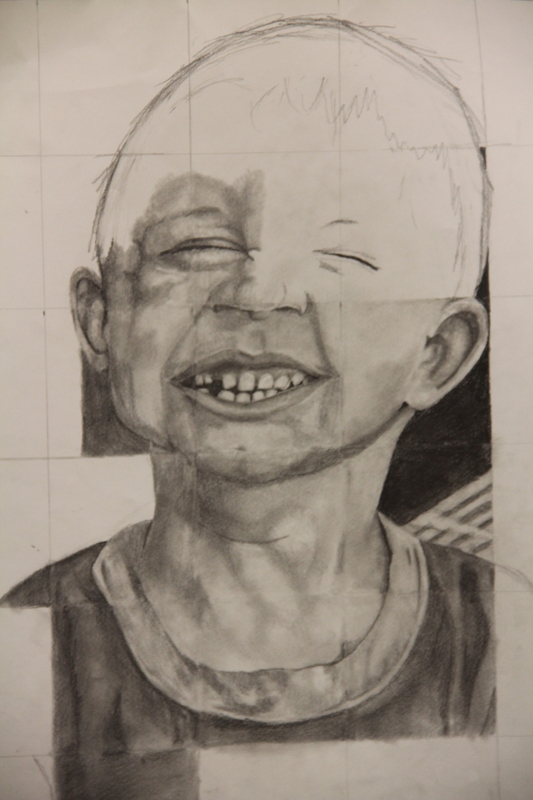 Drawing/Painting I students are creating large format drawings based on the use of a grid and focusing on the application of tones to create volume in their drawings.